Why Did Moroni Speak of Pulling Down Pride? Perhaps Moroni recalled that a great and spacious building in Nephi’s vision represented the “pride of the world” and that “it fell, and the fall thereof was exceedingly great” (1 Nephi 11:36).4 Or maybe he was thinking of the “pomp” of Lucifer who had “fallen from heaven” and was “cut to the ground” (Isaiah 14:11–12). Whatever the case, his warning that the proud would be leveled to the earth seems to be right at home with a number of other scriptures dealing with the consequences of pride. 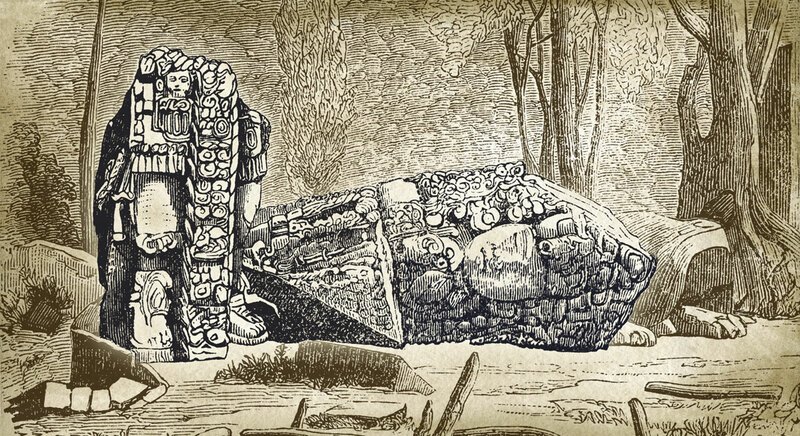 At Cholula, a group of large stone stelae were “thrown down and intentionally smashed.”15 And in Copan, a stela inscription begins with a reference to the “toppling of the Foundation House,”16David Stuart, an expert in ancient Mesoamerican inscriptions, interpreted this as “a possible metaphorical reference to the end of Copan’s ruling line.”17 In light of these findings, Moroni’s metaphorical statements about pulling down the rulers’ pride seem to nicely fit an ancient American context. President Ezra Taft Benson referred to pride as the “universal sin” and “the great vice.”18 Similarly, President Dieter F. Uchtdorf has taught, “Pride is the great sin of self-elevation. It is for so many a personal Rameumptom, a holy stand that justifies envy, greed, and vanity.”19 Those in this state of self-elevation often become self-absorbed and calloused to others’ needs. Ultimately, when we begin to comprehend our complete dependence upon Jesus Christ—who both created us and atoned for sins—we will begin to see why, in the end, “every knee shall bow, and every tongue confess before him” (Mosiah 27:31).21 In one of the gospel’s insightful ironies, those who refuse to humble themselves will, like Lucifer, be pulled down to the dust (Genesis 3:14). In contrast, those who willingly humble themselves to the dust and obey God’s commandments will be raised up into eternal life (3 Nephi 15:1).22 As the prophet Alma taught, “Yea, he that truly humbleth himself, and repenteth of his sins, and endureth to the end, the same shall be blessed—yea, much more blessed than they who are compelled to be humble” (Alma 32:15). Kerry Hull, “War Banners: A Mesoamerican Context for the Title of Liberty,” Journal of Book of Mormon Studies 24 (2015): 84–118. Dieter F. Uchtdorf, “Pride and the Priesthood,” Ensign, November 2010, 55–58, online at lds.org. Ezra Taft Benson, “Beware of Pride,” Ensign, May 1989, online at lds.org. 1.For more references to pulling down pride, see Alma 4:19; 51:21; 60:36. 2.See Exodus 34:13; Leviticus 26:30; Judges 6:25, 28, 30; 2 Samuel 22:28; 1 Kings 8:32–33; 2 Kings 10:27; 18:4; 2 Chronicles 14:3; 15:16; 31:1; 34:4; Job 14:2; 40:12; Psalm 18:27; 20:8; 30:3; 37:2; 55:23; 59:11; 107:12; Isaiah 5:15; 14:11–12, 15; 22:19; 25:11–12; 43:14; 63:6; Jeremiah 1:10; 18:7; 24:6; 42:10; 51:40; Lamentations 2:2; Ezekiel 17:24; 26:20; 28:8; 31:18; Obadiah 1:4; Zechariah 10:11. 3.See 1 Nephi 13:9; 14:2, 7; 16:25; 18:17–18; 2 Nephi 1:7, 21; 2:29; 26:15; Jacob 6:7; Enos 1:10; Mosiah 7:28; Alma 4:19; 10:18; 12:6, 37; 13:30; 30:23, 47; 42:29–30; 51:21; Helaman 1:24; 6:5, 25; 14:19; 17:10; 3 Nephi 21:15; Ether 2:11; Moroni 8:14. 4.For similar imagery related to Babylon, see Isaiah 21:9; Revelation 14:8; 18:2; Doctrine and Covenants 1:16. 5.See Book of Mormon Central, “Why Did Riplakish Construct a Beautiful Throne? (Ether 10:6),” KnoWhy244 (December 2, 2016); John L. Sorenson, Mormon’s Codex: An Ancient American Book (Salt Lake City and Provo, UT: Deseret Book and Neal A. Maxwell Institute for Religious Scholarship, 2013), 370–371, 577; Robert Sharer, “Time of Kings and Queens,” Expedition 54, no. 1 (2012): 27–28. For iconography depicting Mesoamerican rulers seated on elevated thrones, see Simon Martin and Nikolai Grube, Chronicle of the Maya Kings and Queens, 2nd edition (New York, NY: Thames and Hudson, 2008), 15, 60, 62, 77, 135, 143, 147, 149 153, 201. 6.For the comments about the rulers idly sitting on their thrones, see Alma 60:7, 11, 21–22. 7.The concept of dethroning a king is mentioned in Mosiah 29:21. 8.See Book of Mormon Central, “Why was Coriantumr’s Record Engraved on a ‘Large Stone’? (Omni 1:20),” KnoWhy 77 (April 13, 2016). 9.See Kerry Hull, “War Banners: A Mesoamerican Context for the Title of Liberty,” Journal of Book of Mormon Studies 24 (2015): 84–118. 10.See Book of Mormon Central, “Why Did Moroni Quote the Patriarch Jacob about a Piece of Joseph’s Coat? (Alma 46:24),” KnoWhy 154 (July 29, 2016). 11.It is also notable that the phrase “lifted up” is associated with pride in many Book of Mormon passages. For a few examples, see 2 Nephi 28:12; Jacob 1:16; Mosiah 11:5, 19; Alma 31:25; Helaman 3:34; 3 Nephi 6:10; 4 Nephi 1:24; Mormon 8:28. 12.See Morgan Deane, “Experiencing Battle in the Book of Mormon,” Interpreter: A Journal of Mormon Scripture 23 (2017): 240. For a broader, cross-cultural treatment of this same phenomenon, see Sarah Ralph, ed., The Archaeology of Violence: Interdisciplinary Approaches, IEMA Proceedings, Volume 2 (Albany, NY: State University of New York Press, 2012). 13.Martin and Grube, Chronicle of the Maya Kings and Queens, 153. 14.David A. Freidel, Barbara MacLeod, and Charles K. Suhler, “Early Classic Maya Conquest in Words and Deeds,” Ancient Mesoamerican Warfare, ed. M. Kathryn Brown and Travis W. Stanton (Oxford, UK: Alta Mira Press, 2003), 196. 15.Geoffrey G. McCafferty, “Ethnic Conflict in Postclassic Cholula, Mexico,” in Ancient Mesoamerican Warfare, 233. Although this example significantly post-dates Book of Mormon times, it helps demonstrate that ritual desecration was an enduring cultural phenomenon in pre-Columbian Mesoamerica. 16.Martin and Grube, Chronicle of the Maya Kings and Queens, 153. 17.Gyles Iannone, “The Rise and Fall of an Ancient Maya Petty Royal Court,” Latin American Antiquity 16, no. 1 (2005): 39; citing David Stuart, “Historical Inscriptions and the Maya Collapse,” in Lowland Maya Civilization in the Eighth Century A.D., ed. Jeremy A. Sabloff and John S. Henderson (Washington D.C., Dumbarton Oaks Research Library and Collection, 1991–1992), 346. 18.Ezra Taft Benson, “Beware of Pride,” Ensign, May 1989, online at lds.org. 19.Dieter F. Uchtdorf, “Pride and the Priesthood,” Ensign, November 2010, 56, online at lds.org. 20.See Book of Mormon Central, “Why Did Mormon Say the Children of Men are Less than the Dust of the Earth? (Helaman 12:7),” KnoWhy 183 (September 8, 2016). 21.See Book of Mormon Central, “Why Did the People Fall Down at the Feet of Jesus? (3 Nephi 11:17),” KnoWhy 202 (October 5, 2016); Matthew L. Bowen, “‘They Came and Held Him by the Feet and Worshipped Him’: Proskynesis before Jesus in Its Biblical and Ancient Near Eastern Context,” Studies in the Bible and Antiquity 5 (2013): 63–68; Matthew L. Bowen, “‘They Came Forth and Fell Down and Partook of the Fruit of the Tree’: Proskynesis in 3 Nephi 11:12–19 and 17:9–10 and Its Significance,” in Third Nephi: An Incomparable Scripture (Salt Lake City and Provo, UT: Deseret Book and Neal A. Maxwell Institute for Religious Scholarship, 2012), 107–130; Matthew L. Bowen, “’And Behold, They Had Fallen to the Earth’: An Examination of Proskynesis in the Book of Mormon,” Studia Antiqua 4, no. 1 (2005): 91–110. 22.For a similar concept, see Matthew 11:11; Luke 7:28; Doctrine and Covenants 50:26.